From USA TODAY bestselling series Vampire Girl, comes the next book in the saga: MIDNIGHT STAR. 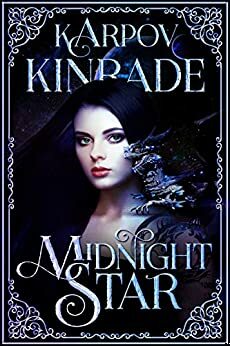 For fans of Twilight, A Shade of Vampire, and Outlander, experience a fantasy romance with an original twist on an old tale. The vampires have enslaved the Fae for too long, and they deserve justice. But the Fae are punishing the innocent for the sins of the guilty. War begets war. Blood begets blood. My bloodline binds me to the Fae, just as my blood oath binds me to the vampires. They are forcing me to choose sides. To fight for one against the other. I must decide between my heart and my conscience. This is a great and original story, and I gave book one five stars. But book two has way to many continuity problems to enjoy the book fully. It needs to be re read by some beta readers maybe. 5.0 out of 5 starsGetting better and better! This is the second book in the Vampire Girl series. It's twists and turns turned the expected to the unexpected. The depth of writing leaves you breathless picturing scenes (and scenery) feeling immersed in the world of the character. Both books have left me amazed and I for one cannot wait for Arianna's journey to continue. Loved reading this book. The sequel to Vampire Girl and it was just as good as the first. This time we went over to the Asher's realm and I loved his one too. We keep finding out new secrets and I really enjoy not know what will come next. I'm excitedly waiting for the third book. Great book, can't wait to see what happens next. Everything is heating up and the plot is so interesting, I have no idea what will happen next and it is very exciting. A must-read. Loved the book and can't wait for the next one . That is the only thing wrong with readers the books are to small. This is a great read I would recommend it to everyone .